Japan will soon be out of pagers after its only provider said Monday it will terminate the service next September, with the device — first introduced half a century ago — made redundant by mobile phones. Around 1,500 customers have remained subscribers to Tokyo Telemessage Inc., including people working in hospitals who favor the device because it doesn’t emit electromagnetic waves. The company’s current service area covers Saitama, Kanagawa and Chiba prefectures as well as Tokyo. 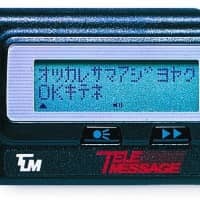 Tokyo Telemessage is planning to start a new radio service using the frequencies that were allocated to pagers. President Hidetoshi Seino said it will provide governments in other regions with information to help manage disaster relief operations more efficiently. Beeper services began in Tokyo’s 23 wards in July 1968 with Telephone Public Corp., a predecessor of NTT Corp., and eventually spread nationwide. They aroused strong demand from hospitals, businesses and government offices, with the number of subscribers topping 10 million in 1996. The popularity of pagers grew in the 1990s with female high school students becoming ardent fans; they came up with clever number combinations to exchange messages. NTT Docomo Inc., the mobile unit of NTT, terminated its pager service in 2007, leaving only regional operators such as Tokyo Telemessage in the business. Last year, Okinawa Telemessage, based in Naha, Okinawa Prefecture, ended its service. 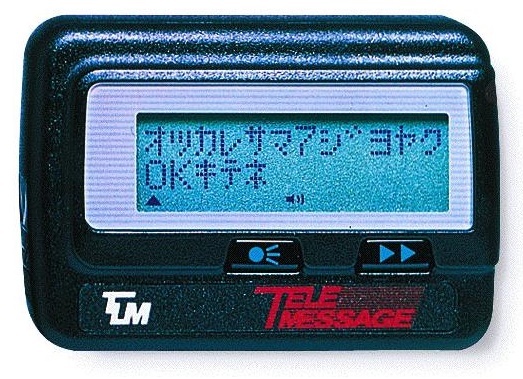 Tokyo Telemessage once filed for bankruptcy but was purchased by another firm and has continued its pager service. pagers, pocket bells, Tokyo Telemessage Inc.